Actually, this isn't an "about us" page. It's more of an "about YOU" page. You see, we realize that pills and powders have come to dominate the choices you have on the market. And, guess what? You either get a formula that A) tastes amazing but has a sub-par ingredient profile, B) has a killer ingredient profile, but requires you to chase every last sip with a lime and some salt to kill the bitter beer face taste, or C) you have to gag down a gang of pills. And that's not fun. At Power Chews, we're all about bringing the excitement of results, the thrill of success, and the "OMG that tastes GREAT" back into YOUR supplementation. In short, we're about bringing the fun back to you. You see, not only do we jam pack your formulas with the highest quality, pharmaceutical grade ingredients provided in significantly effective doses, but we've developed your formulas with four of the most deviously delicious, blow-your-mind amazing flavors. And these flavors...well, they're packin' some serious bite! We're talking about flavors such as Watermelon Felon, Low Down Dirty Lime, the Mango Meanie, and the Tropical Tag-Team Terror...the Sucker Punch Bunch. It's like Trick or Treat for athletes and bodybuilders! 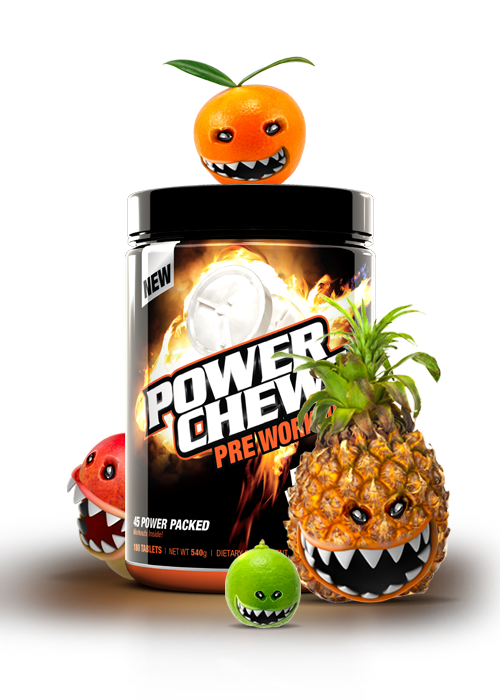 So if you're bored out of your skull with the traditional pills or powders choice, then we invite you to add some fun back into your life, your training, and your supplementation with the Power Chews formulas. And, we're so confident you'll love the Power Chews line up that we've backed it with our 100%, no risk, money back guarantee.